I maintain a page on zeef.com about the upcoming Java EE 8 specification. On this page I collect all interesting links about the various sub-specs that will be updated or newly introduced in EE 8. The page is up since April last year and therefor currently has almost 10 months worth of data (at the moment 8.7k views, 5k clicks). As we can see the specs that occupy the top 5 are still the same, but whereas JSF 2.3 was the most popular sub-spec where it concerned a single link, looking at all links together it's now MVC 1.0. The umbrella spec Java EE however is still firmly on top. The bottom segment is even exactly the same, but for most of them very few information is available so a block is basically the same as a link. Specifically for the Java EE Management API and JSON-P 1.1 there's no information at all available beyond a single announcement that the initial JSR was posted. While the above ranking does give us some data points, we have to take into account that it's not just about the technologies themselves but also about a number of other factors. E.g. the position on the page does influence clicks. The Java EE 8 block is on the top left of the page and will be seen first by most visitors. Then again, CDI 2.0 is at a pretty good position at the top middle of the page, but got relatively few clicks. JSF 2.3 and especially MVC 1.0 are at a less ideal position at the middle left of the page, below the so-called "fold" of many screens (meaning, you have to scroll to see it). Yet, both of them received the most clicks after the umbrella spec. The observant reader may notice that some key Java EE technologies such as JPA, EJB, Bean Validation and Expression Language are missing. It's likely that these specs will either not be updated at all for Java EE 8, or will only receive a very small update (called a MR or Maintenance Release in the JCP process). Oracle has indicated on multiple occasions that this is almost entirely due to resource issues. Apparently there just aren't enough resources available to be able to update all specs. Even though there are e.g. dozens of JPA JIRA issues filed and persistence is arguably one of the most important aspect of the majority of (web) applications, it's just not possible to have a major update for it, unfortunately. In general we can say that for this particular data point the web technologies gather the most interest, while the back end/business and supporting technologies are a little less popular. It will be interesting to see if and if so how the numbers will change when more information become available. Java EE Management API 2.0 for one seems really unpopular now, but there simply isn't much to measure yet. I thought EJB will be merged with CDI. It is interesting how MVC will compete with JSF. >I thought EJB will be merged with CDI. In a way that's indeed what has been asked for and what several spec leads have indeed hinted at. The idea though is not so much to do a full scale merging of the EJB spec into the CDI spec, but to look at the most useful features from EJB and reimplement them *on top* of CDI. One of the best existing examples of this is JTA's @Transactional, which resides within the JTA spec but builds on CDI and interceptors. For Java EE 8 I hope to see things like @Asynchronous being implemented by the Concurrency spec and have it too build on CDI. Just moving or merging things into CDI itself is not likely the best way to go, since we'll end up with exactly the same thing again but under a different name. >It is interesting how MVC will compete with JSF. It's a touchy topic. There's an enormous amount of competition in the web framework space already. I personally don't feel there was much need for Java EE to compete internally with itself, but alas, that ship has largely sailed. (edit) How I see it: EJB specification is just about services it provides. There is no "EJB component" and it's lifecycles. We are just assigning services to CDI managed beans. >>It is interesting how MVC will compete with JSF. >It's a touchy topic. There's an enormous amount of competition in the web framework space already. I personally don't feel there was much need for Java EE to compete internally with itself, but alas, that ship has largely sailed. 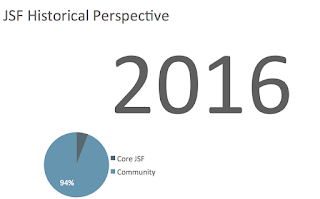 Should the community take over JSF.next or not?